Autumn. Sometime in the mid-80s. Freshers' week at a red brick university in the West Midlands. A small-town escapee, there to study politics, is unpacking her few possessions in a tiny room on the tenth floor of the student halls. She doesn't have much in the way of stuff - mix tapes, eyeliner and pot noodles - but one box is precious. It is a box two-thirds full of books, their bottle-green spines, cracked and broken, their covers dog-eared from copious reading. These books were not just books. They were my road maps, my bibles. And they had two things in common. They were all by women and they were all by the same publisher: Virago. By the time I encountered them, Virago had been going for more than ten years. Launched in 1973 by the ferociously ballsy Carmen Callil, Rosie Boycott and Marsha Rowe as the "first mass market publisher for 52% of the population - women. An exciting new imprint or both sexes in a changing world." But I didn't know that. I thought they were my personal discovery (the same applied to Velvet Underground...). Thanks to Virago I left home with Angela Carter, Maya Angelou and Margaret Atwood for company. The Edible Woman, I Know Why The Caged Bird Sings, Nights at the Circus... Just three of the titles that accompanied me from small-town Hampshire to Birmingham and then down to London. And as I travelled they grew in number - the Atwoods, Angelous and Carters - and they were joined by others. Thanks to the editors at Virago Modern Classics I discovered Stevie Smith and Radclyffe Hall, Antonia White and Rosamund Lehman and far far more. For many years, if a book had a bottle-green spine I bought it. That they had thought it worth publishing was recommendation enough. Recently, though, I thought I'd slightly fallen out of love with them. Out-grown them, maybe? And then I looked at my bookshelves: Sarah Waters, Paula McLain, Marilynne Robinson and, this year alone, Clare Messud, Sarah Churchwell and Tracey Thorn. All bear the familiar half-eaten apple on their spines, although the dark green covers that lined my student shelves are no more. 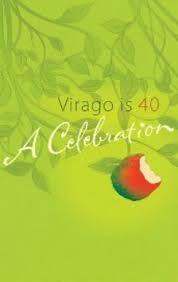 This week, Virago is 40. And so am I. Ish. (Give or take a few years). By way of celebration (for their birthday, not mine), they asked 40 of their wonderful authors to compose a piece inspired by the number 40. The resulting poems and memoirs, essays, stories and fables is introduced by Margaret Atwood and will be published as a free e-book on 4 July. Forty years ago, Virago set out to change the world. They certainly changed mine.